Trump, appearing at a boisterous rally in Las Vegas, defended his embattled Supreme Court justice nominee, touted the booming stock market, cited progress in talks with North Korea and pledged to build his long-promised border wall, while also making the pitch for Nevada to re-elect Sen. Dean Heller. The president noted that he and Heller — who once said he “vehemently” opposed Trump — did not always get along. “We started out, we weren’t friends. I didn’t like him, he didn’t like me!” said Trump to laughs. “But as we fought and fought and fought, believe it or not we started to respect each other, than we started to like each other, then we started to love each other. Heller returned the praise: “Mr. President, I think you just turned Nevada red today,” he said. 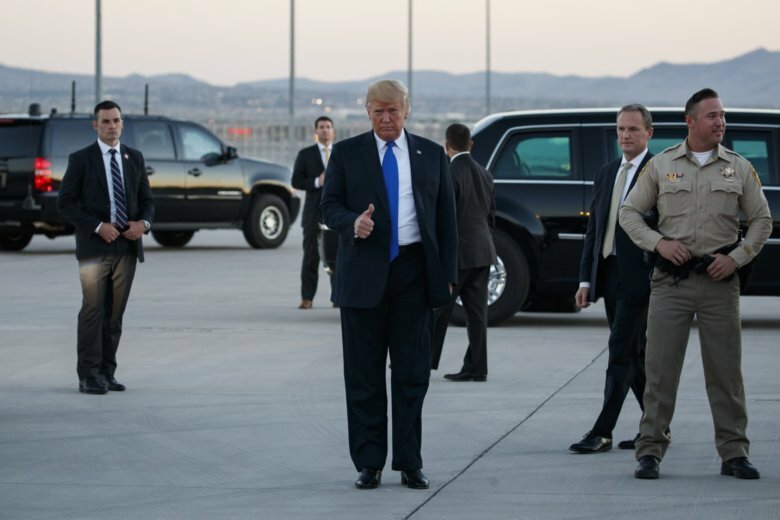 Trump narrowly lost Nevada to Hillary Clinton in 2016 despite his deep ties to Las Vegas — he has a golden-hued hotel just off the famed Strip — and repeatedly campaigning in the state. As usual, Trump went after the media and many who attended the rally followed his lead. One man stood behind the president’s traveling press corps, repeatedly yelling the word “traitors” at the journalists. At one point reading from a list of his administration’s accomplishments, Trump spent much of the rally focused on what advisers believe is his — and his party’s — best issue, the strong economy. He took credit for the stock market’s gains and the nation’s low unemployment rate and bragged about boosting the military, while accusing Democrats of doing their best to foster division and stall the growth. Though he fervently tried to wrap his arms around the president Thursday, Heller’s relationship with Trump has been tumultuous. Weeks before the 2016 election, Heller infamously said that he was “100 percent against Clinton, 99 percent against Trump,” a remark the president has not forgotten. Heller drew the president’s ire a year ago when he held up Republican efforts to repeal former President Barack Obama’s signature health care law. But Trump saved Heller from a costly and damaging primary battle earlier this year by persuading a very conservative primary challenger, Danny Tarkanian, to drop out of the Senate race and instead seek a House seat. Heller is now in a close race with Rosen, a first-term congresswoman who stands to benefit from a wave of Democratic and female activism fueled by opposition to Trump. And the senator, at times, has struggled to strike a balancing act of praising the president, who remains popular among Republicans, while distancing himself from Trump’s scandals and provocative positions. This story has been corrected to show the Senate is divided 51-49, not 50-49.